We will always have new epidemics: Lessons from Ebola, enterovirus, MERS, influenza. Human behavior is the biggest variable in any outbreak. Health workers dress in protective clothing before taking the body of an Ebola victim from the Island Clinic Ebola treatment center on Oct. 13, 2014, in Monrovia, Liberia. Ebola. Enterovirus D68. MERS. Influenza H7N9, H10N8, H5N1, H1N1. Chikungunya. Babesia. Heartland virus. Zika virus. Anaplasma. Some of these pathogens are infamous. They make the news because they cause dramatic symptoms or have high death rates. Some are newly discovered viruses that we’ve never previously encountered in nature. Others are microbes we’ve been tracking for decades that have exploded or spread into new areas and new populations. We are awash in epidemics, large and small, localized and global. A possibly apocryphal quote is widely shared in infectious disease circles. In 1967, Surgeon General William H. Stewart was reported to have said: “It’s time to close the book on infectious diseases, and declare the war against pestilence won.” After all, we had antibiotics to treat the killer scourges of the past centuries and vaccines to prevent many others. Surely we were past that vulnerable stage of our existence when a human could be felled by something as primitive, as small and weak, as inconsequential as a mere microbe. This sentiment could not have been more wrong, even in wealthy countries such as the United States. At roughly the same time as Stewart’s supposed proclamation, a new virus called Marburg was identified in Germany. A cousin of Ebola, the virus sickened laboratory workers who were studying cells taken from monkeys imported from Uganda. A decade later, Ebola itself emerged in central Africa, causing simultaneous outbreaks in what were then Zaire and Sudan. In that same decade, well-known pathogen Staphylococcus aureus was found to cause a new type of disease in healthy women: toxic shock syndrome, associated with tampon use. The first paper demonstrating a bacterial cause for Lyme disease, a new syndrome observed in children in Connecticut, was published in 1982, followed soon after by the recognition that HIV was the cause of AIDS. We will never be free of epidemics. We will always be at risk from newly discovered and emergent diseases such as Nipah and Hendra, as well as those dating back into antiquity, such as cholera, malaria, and influenza. It’s been estimated that there are on the order of 320,000 undiscovered mammalian viruses lurking out there. Some, certainly, will cause disease in humans. In many ways, we’re about as limited in our options as our ancestors were when they had to deal with yellow fever, smallpox, or bubonic plague. Despite our success with medications, vaccination, and sanitation, the current Ebola outbreak shows that we are woefully unprepared for new infectious diseases. When they hit us at our most vulnerable, we resort to centuries-old practices to contain them: isolation, quarantine, and methods that rely on the most difficult challenge of all, modifying human behavior. We know, in theory, how to prevent and control infectious diseases. With Ebola, it is quite simple: Identify cases. Keep those who are sick away from those who are well to break the cycle of transmission. Watch those who were exposed to a sick person to make sure they don’t get sick. If they do, repeat the previous steps until there are no more sick patients to isolate and no more exposed individuals to monitor. It is almost achingly easy as a concept. But human behavior throws a wrench into this. Humans are not Vulcans. We know that many people will not consider the good of the community when it conflicts with one’s own personal comfort. So people break quarantine, like the Nigerian diplomat who fled Lagos after developing symptoms of Ebola and exposed others in Port Harcourt. People chase away or even murder medical workers, fearful that they will take loved ones away, perhaps believing horrible rumors about the origin of the outbreak and ulterior motives of these workers. They may simply worry that they will never see their loved one again, who will die alongside strangers in a makeshift hospital rather than at home among those who adore them. If family members are nursed in their homes, likely by relatives with no training or protective gear, the chain of deaths will continue, felling mothers, daughters, sons, brothers, husbands. The virus turns compassion into a death sentence. Campaigns warning against ritual burials and cleansing practices may fail as family members feel it is critically important for their loved one to get a proper send-off into the afterlife—which includes touching the corpse and transporting it if necessary for burial on the family land. While we might try to prevent these practices through education, we need to understand that asking people to change these behaviors is asking them to change their long-held beliefs about sickness and death, living and dying, practically overnight. Fear—of the virus, of medicines and health care workers, of rumors—spreads as quickly as the virus itself and is just as deadly. This epidemic of fear is difficult to alleviate even in the harsh spotlight of science and statistics. Calls for quarantine and bans on travel have taken up the attention of almost every politician over the past two weeks. Despite uniform agreement by associations of epidemiologists and global health experts that such measures would be counterproductive, a ham-fisted quarantine was temporarily instituted in New Jersey on a nurse who had recently returned from work with Ebola patients in West Africa. New York Gov. Cuomo initially agreed with the quarantine of any worker, but later dialed that back somewhat. Human behavior played a role in setting the stage even before the current Ebola epidemic was sparked. Health care infrastructure in Guinea, Liberia, and Sierra Leone suffered from neglect. Years of civil war in the latter two countries decimated both governmental services and any public trust thereof. Long-term risks to the public and the environment were ignored when forests were cleared for profit, sending more people into bats’ shrinking habitat and exposing them to the viruses bats carry, including Ebola. People eat bats, as well. Health authorities in Guinea sought to stomp out this behavior after the epidemic was underway, but by that point it probably would not have made a difference: The virus had already crossed over to the human population, as infectious diseases from wild animals do all over the world. With our fortunate vantage point in the United States, we may think that these rules don’t apply to us. We may believe, as immunologist and Nobel Prize winner MacFarlane Burnet expressed in 1962, that infectious diseases have been eliminated as a significant factor in social life. We may see ourselves as more rational and more accepting of the realities of health and disease than those in West Africa, who many Americans misunderstand and view as backward. Yet many of us also fail to modify our behaviors to control our own infectious disease epidemics. In the United States, 50,000 new cases of HIV are contracted each year, even though we know that condoms and pre-exposure prophylaxis can massively decrease the risk. Influenza kills up to 49,000 people every year in the United States. Vaccination can significantly reduce disease and the risk of death, but only about 40 percent of the adult population and 50 percent of those under 18 get the influenza vaccine. Ninety percent of kids who died of influenza last year were unvaccinated. The anti-vaccine movement—those who eschew most or all shots—is still small but growing, particularly in white, upper-middle-class parts of the country. Behavior is so difficult to modify, we can’t even get people to do something as simple as wash their hands regularly. Modern technology—condoms, vaccines, Zmapp, antibiotics, personal protective gear, insect repellent against vector-borne diseases—are only as good as their availability and their correct use. Prevention must be prioritized, not only by individuals who should get their vaccines and wash their hands, but also by governments and the international community, who must make prevention a political priority. We know they can do this. Funding for influenza and other pathogens was made a priority in the previous decade. The problem is that when these immediate threats seem to fade, the money often disappears with them—until the next epidemic occurs and the cycle begins anew. Still, even with early detection and containment, we can only slow emerging epidemics. Even if we institute travel bans or do everything in our power to keep infections out, microbes are stealthy and don’t respect borders. We will continue to see the sparks, whether they come from a threat we already knew about, from one of the hundreds of thousands of as-yet-undiscovered mammalian viruses, or from something we haven’t even conceived of yet. All of our technological advances can only take us so far. Human behavior is the variable that is the biggest question mark in any disease intervention. We can have the best vaccine in the world, safe and effective, but it won’t stop disease if no one will use it. This is why it’s so critical to catch these outbreaks as early as possible. It’s easier to get 20 people to cooperate with an intervention than 1,000, or 1 million; to stop a fire when it is merely sparks rather than a raging inferno. 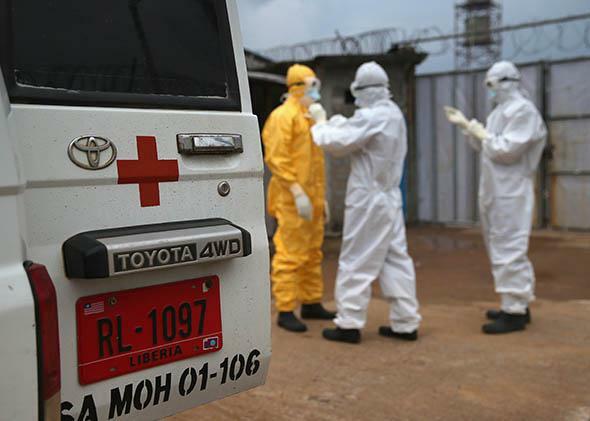 We were far too late in responding to the sparks of the current Ebola epidemic. Even if we succeed, it won’t be our last.